The boardwalk community of Telegraph Cove has a protected marina, and is a mecca for the tourism industry during the summer months on Vancouver Island. Like a haven set in the wilderness, Telegraph Cove is nestled into a tiny inlet on the eastern coast of Northern Vancouver Island. 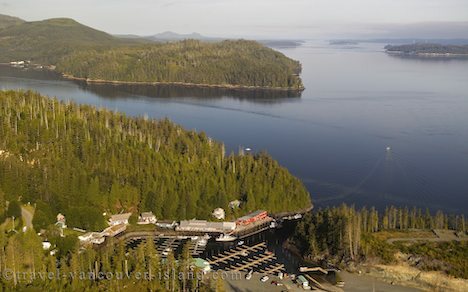 As well as being a quaint boardwalk community, Telegraph Cove is situated at at the junction of Johnstone Strait, Queen Charlotte Strait, and the Broughton Strait making it a convenient destination for an array of activities such as fishing, wildlife watching, or just cruising the pristine waters. An aerial view of Telegraph Cove and the water ways of Northern Vancouver Island, British Columbia, Canada. Aerial view of the community of Telegraph Cove and Johnstone Strait on Northern Vancouver Island.